Social media super stars, political flop stars? Film stars entering politics and trying to show their power is nothing new. With the advent of social media, almost all stars have their own following and the following of superstars surprise all. 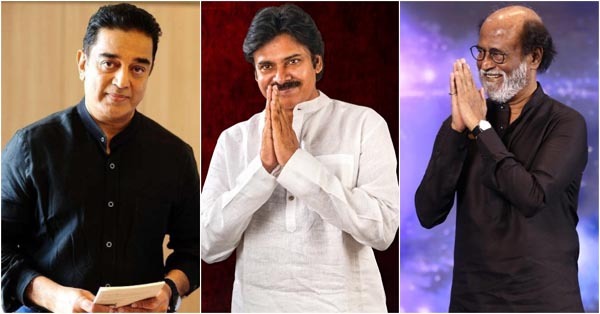 Stars like Rajinikanth, Pawan Kalyan, Chiranjeevi and Kamal Haasan have huge fan following on social media. The moment they try to give any message, their followers get an idea about it and implement before the message comes out. This power makes them believe that even in real life they can make wonders. They believe that with social media and fan following when used in collaboration in real life they can work for the betterment of the society unlike the earlier case when stars like MGR, NTR, Jayalalithaa, Karunanidhi worked hard to gain mass following in real life before they became Chief Ministers. But much to the surprise of all, the social media following of Pawan Kalyan, Kamal Haasan, Rajinikanth is not turning into real life following. In fact they are unable to make any powerful impact on politics which many expected to do going by their social media following. The same thing happened in case of Mega star Chiranjeevi when he launched his political party Praja Rajyam. He finally realized that reel following and social media following which they gained with mass entertainers is completely different from the mass following in real life gained through the politicians. Unless until they realize this difference, film stars who are social media super stars will get shock from political stars who turn them into political flop stars.